I’d been waiting for something like two years for Google Earth to get high-resolution images of Stokes County. Finally they do! Here’s a Google Earth view of my land. The property line is the white triangle in the lower left foreground. That’s Hanging Rock State Park looming high in the background. 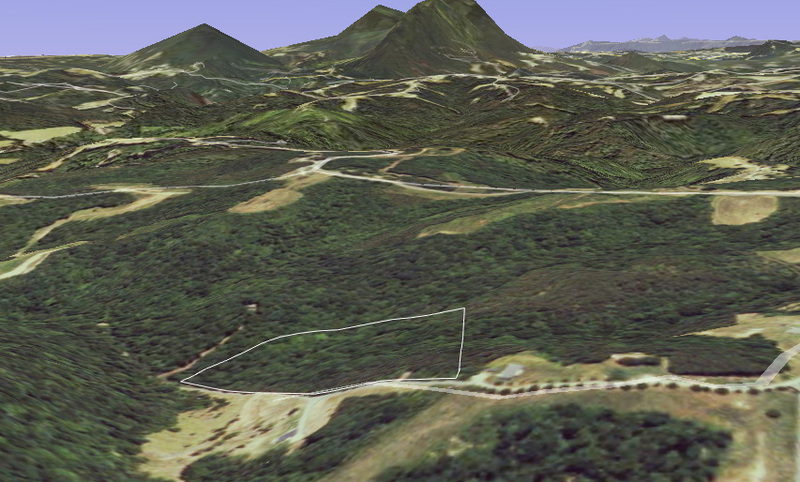 The elevation of the park is exaggerated a bit by Google Earth (the park’s actual altitude is over 3,000 feet, compared with 910 feet for the highest part of my land). For scale, my road frontage along that gravel road is 763 feet. As you can see, I’m on the south-facing side of a little valley. A small stream runs across my property and intersects with another small stream at the lower end. The conjoined streams then run to the Dan River about 1.5 miles farther down. This was written by daltoni. Posted on Tuesday, November 20, 2007, at 9:13 pm. Filed under Stokes County, The land. Bookmark the permalink. Follow comments here with the RSS feed. Post a comment or leave a trackback.